Dads, Inc.! Downeast Alternative Design Solar, is a non-profit, Ed. Corp. Maine, with IRS tax exempt status (donations to DADS, Inc. are tax deductable). A membership program for potential full-time and time-share solar community participation is available. Contact Us ! dadsolar.com is the web-site of downeast alternative design solar. We work in conjunction with other Maine based solar education corporations. Our purpose is ... "To promote awareness of solar energy capabilities and demonstrate appropriate alternative techniques, stressing voluntary cooperation and mutual aid, while working toward self-sufficiency and a world at peace." Here for an effort to secure a future for our Grandchildren ... ! SEADS (Solar Energy Awareness & Demonstration Seminars) and the community in Washington County, Maine ... the 'Sunrise County' ... need your support to help establish the re-birth of the Solar Community Land-trust at the 60 acre property in Columbia, Maine ! The renewed effort, since the property is now fully owned and paid for, by the non-profit educational corporation SEADS of Truth, will evolve with the ideas of families and individuals, interested in a future, for the children of the community and the world ! We need funding as well as energetic effort in the re-building of the Solar-powered Seminar Center and the building of five solar homes with the families and community members. There will be a 'time-share' opportunity as well as full-time living available in this 'back-to-the-land' organic solar experience ! We have finally connected with you here today and need to allow you to take the time to think of just how you may help yourself, your family and the community !﻿ Updates on the Fall 2018 Gathering ! will be posted on the 'Contact Us' page, on this site. Thank you. Please contact us through the page available here - Contact Us page ! 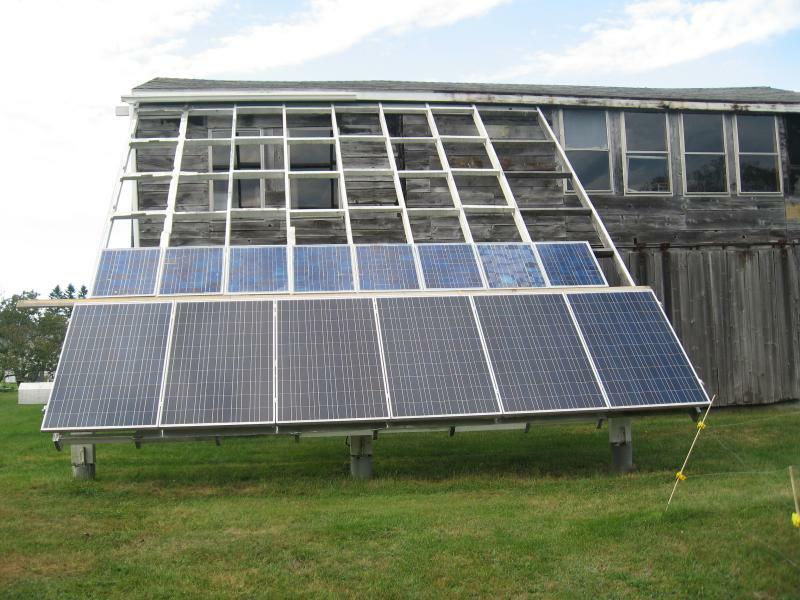 SEADS 'non-profit' educational Corp. in Columbia, Maine, has refocused their energy on establishing a Community Land Trust, for a limited number of Solar Homesteads on the 60 acre property ... ! Here, is the info from the recent brochure, featuring full time and time-share opportunities : call John, 207-546-1639 for more info, Call Now ! Yes, it is Dec 15, 2018 ... thaw, at the SEADS Camp ... 'Working On What's Been Spoiled' ! Do we have all the tools ? The effort will continue, with your help and interest ? I hope so ! Here's the link for more info on the Solar Land Trust development ... If you want to donate or participate, send comments with the form on the 'Colntact Us' page here on the dadsolar.com site ... thank you ! * A New Link for the Maine Solar Primer : On-line version, the printed copies are costly ! 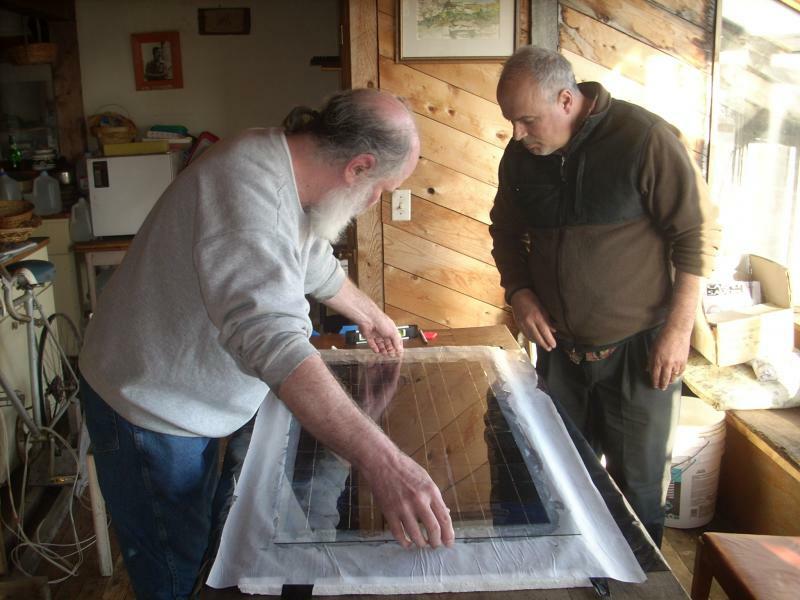 Do-yourself-solar technologies are helping folks make and assemble their own solar electric - photovoltaic (PV) modules and solar thermal (heat and hot-water) panels. We schedule and carry out hands-on seminars and workshops in Maine as well as many other places that folks are interested in "working towards self-sufficiency". 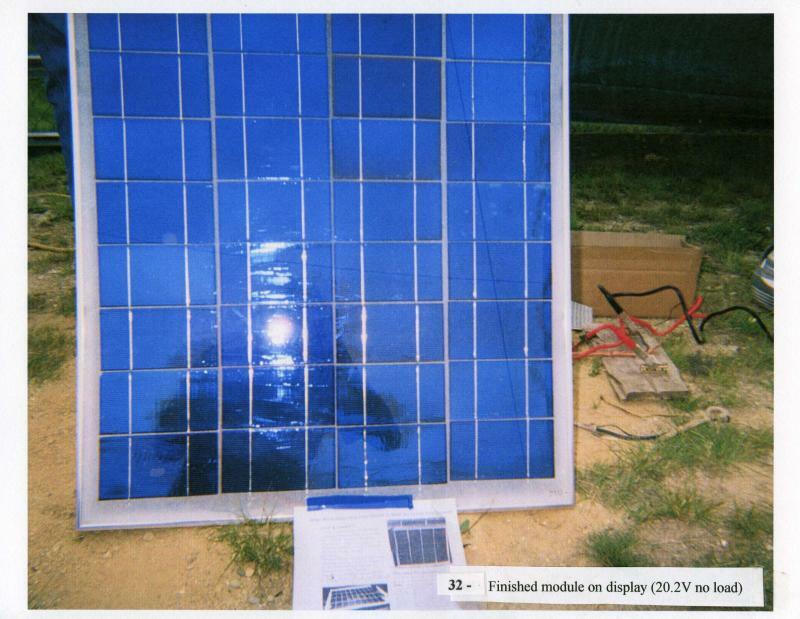 A hand-made 65w PV module on display powering a radio at WERU fair in Maine, June, 2007. We offer free consultation for those desiring a more self-reliant lifestyle. We are a not-for-profit, Solar educational Corp. doing hands-on PV assembly seminars for more than 30 years. We also design and facilitate do-yourself solar greenhouse construction; Solar cookers and food dryers; and thermal projects for heat and hot-water. HOPE Festival, April 23, 2016, at U Maine, Orono, with the Peace & Justice Center of Eastern Maine ! Engineering student (Engineers Without Borders, U Maine Chapter), cutting a solar PV cell for the first time, MESEA demo. ! Yes ! a large crowd of folks come together for Peace & Justice on the Earth Day celebration, HOPE Festival, U Maine, Orono. Mar 14 & 21, 2015 DADSolar, MESEA PV assembly workshop, with Environmental Club, at MCNDHS, NYC, seventh year ! Students with John Burke, DADS, Inc. at the Manhattan Comprehensive Night & Day High School, NYC, Mar 14 & 21, 2015. The Environmental Club participants, display strings of solar cells, ready for encapsulation step. Science teacher, Roy Malinis, photo credit. An abbreviated group of interested folks, attended a PV assembly workshop at the Porter Town Hall, Jan. 12, 2014, after an Ice Storm made the roads too slippery for the planned Sat. event ... A 65 W PV module was accomplished and the OTFS will find a use for the module, or add more ! 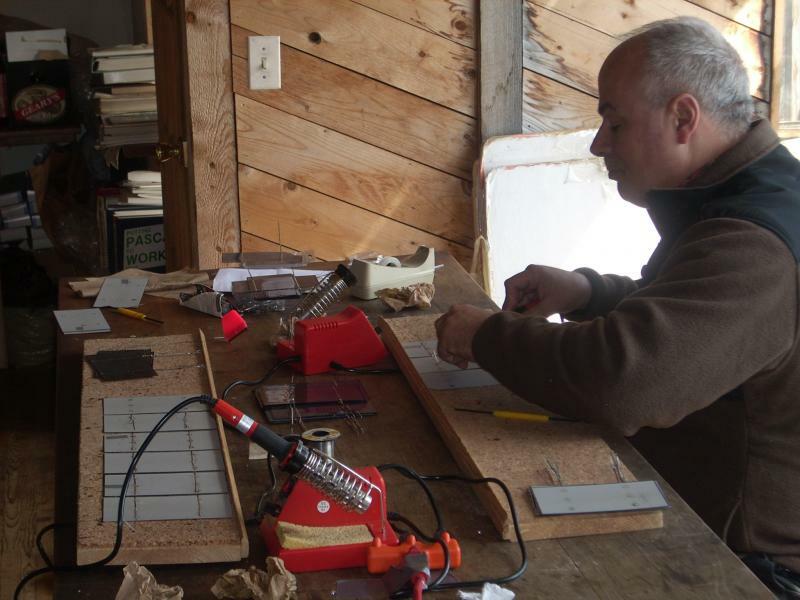 2015 Graduate Phd research, U Dayton, Aquaponic GH, with solar power & heat One year later, Jan 11, 2015, John Burke and Max Amin assemble a 65 W PV module, in a weekend workshop, Long Island, NY. To help with research at U Dayton, Ohio, Engineering Graduate program where MESEA & DADS had worked years past ! Four - 245W 'Canadian Solar' PV modules connected in parallel for 24 V system, on this 'Off-Grid' array, at camp far from the utility poles, Milo, ME, Sept, 2013 MESEA. Battery bank (4 Trojan L-16 RE - 6V, connected in series as 24V); Outback Inverter (2500 W); Schneider charge controller; and PV shut off switch for this 'Off-Grid' camp, Sept, 28, 2013, MESEA. 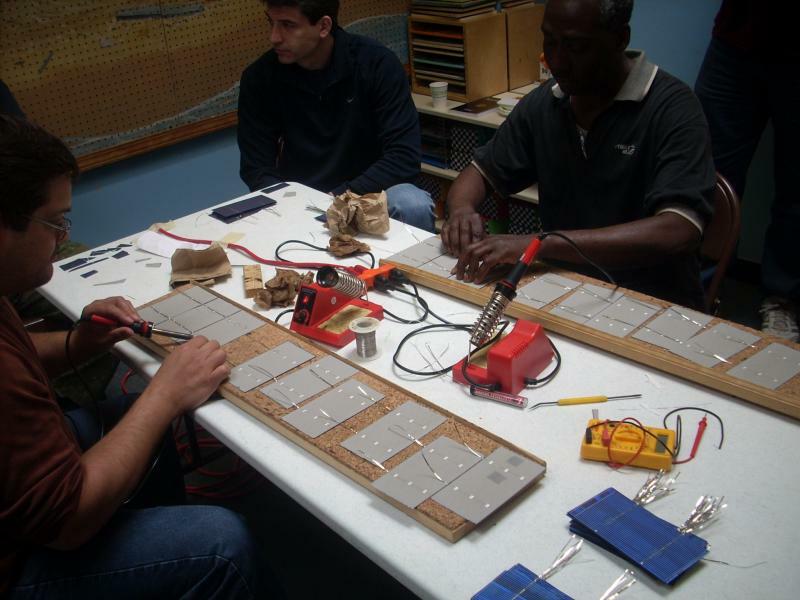 MESEA Workshop participants, solder a string of PV cells for a 65 W PV module during the July, 2013, seminar ! Please see the Services page for full materials list and description of assembly process for the MESEA Solar Cell Phone Charger ... ! Cell ph charger assembly, step-by-step: 1- Diamond wheel and guide for scoring cell for 1/4 size, .5V and 800ma, for 6V cell ph charger, 2013. 2 - Scoring PV cell for proper size, .5V, 800ma, for 6V cell ph charger, 2013. 3 - 12 cut PV cells ready for series connection soldering for cell ph charger, 2013. 4 - 12 cut PV cells in frame for position check, cell ph charger assembly, 2013. 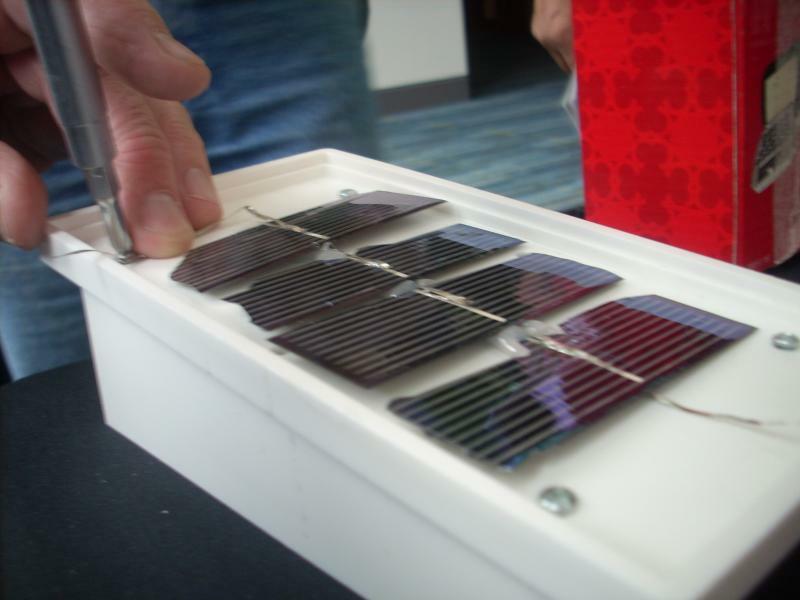 Solar PV workshop participants check string of cells for voltage and amps before encapsulation in 65W PV module. Harrington, Me, Grange - Feb 17, 2008. After hearing concerns from those involved with MESEA, and talking to others, we have tried to give a short explanation of why MESEA is not concerned with the do-yourself-solar PV assembly workshop information being used by those who have experienced it. The reason we give the workshops, is to further our efforts, by spreading the low-tech, do-yourself methods and help those with low skill levels, create a self-reliant lifestyle for themselves and their families. This work, around the world, has helped those with less education and opportunities, establish PV “cottage industries” that will benefit their communities and neighbors. We function as a not-for-profit corporation. Again, our desire is to spread the technology, to help create the beneficial effects between communities, local and world-wide, of self-reliance and sharing. Those who would “profit” by using these simple, low-tech methods are invited to do so, as long as the credit is given to those who have developed the methods used. The same philosophy is attached to other do-yourself-solar projects included in the Maine Solar Primer and on more and more web-sites. Please feel free to help us spread this technology, so those less fortunate may feel the benefits and excitement of creating something that can give them a step towards self-reliant lifestyle and world peace. A world that is not profiting on the exploitation of each other, for non-renewable resources, will be that much closer to reaching true peace. Solar PV assembly workshop participant, April, 2011, in Brooklyn, NY, solders cells for a string to be included in 65W PV module for roof garden use at the Commons. Photo by Mishon, thanks. Dadsolar / MESEA, learning facilitator, John Burke, with PV workshop participants, test a 65W PV module, at the Brooklyn Commons, roof garden. The PV will power a garden fountain and possible irrigation system. This photo by Mishon, April, 2011, thanks. Solar PV workshop soldering table, ready for participants to solder the strings for a 65W PV module. Photo by Otto, Brooklyn, NY, April, 2011. A familiar scene, PV assembly workshop participants, solder cells for PV strings, to be used in the 65W PV module. Alley Pond Environmental Center, Douglaston, Queens, NYC, May 14, 2011... This workshop is a NYSES / MESEA, co-production. An enthusiastic group, around the encapsulated 65W PV module. At the APEC PV workshop, May 14, 2011. This workshop is a NYSES / MESEA, coop workshop. John Burke, of DADSolar, and the MESEA workshop facilitator, prepares soldering board for group at NESEA-NJ PV assembly workshop, So. Plainfield, NJ, March, 2011. 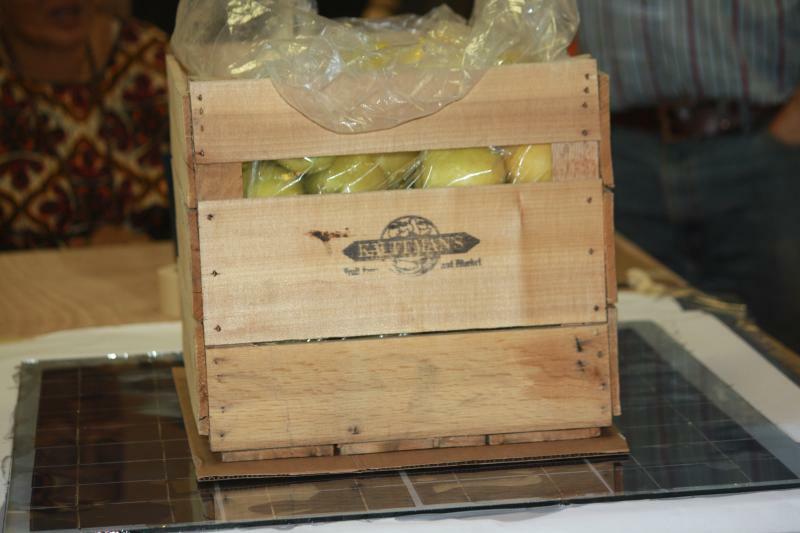 This workshop was hosted by New York Solar Energy Society, (NYSES), an ASES Chapter. 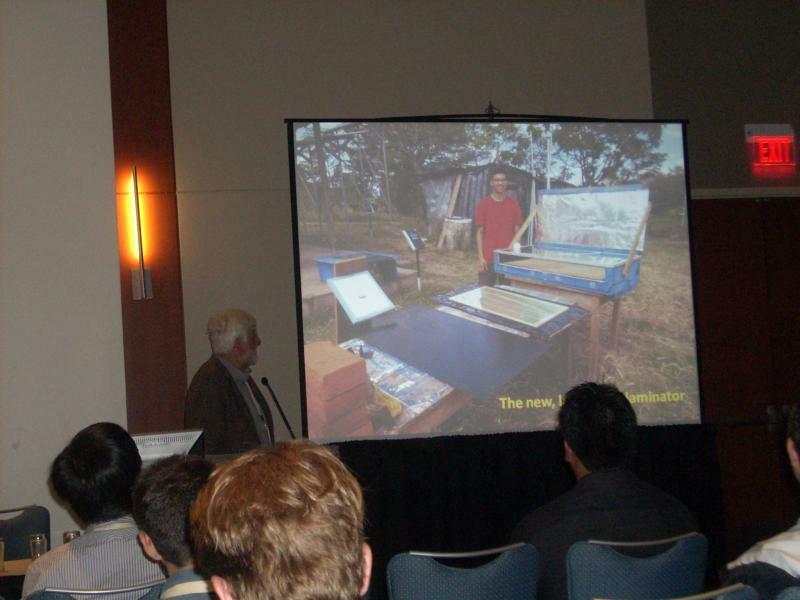 Dr. Richard Komp, presenting low-tech "Solar Oven, EVA lamination" power-point, at the ASES Conference, Raleigh, NC, May 18, 2011. The enthusiastic crowd was interested in this latest innovation for the Third-World PV "Cottage Industry", now in 12 countries. DADS and MESEA are promoting the efforts of Dr. Komp and Skyheat Associates, to establish sustainable renewable energy business development for communities in the developing world. Participants solder solar cells for 65W PV module with Kenya American Society group in New Jersey, Feb. 2012. The group is interested in starting a PV "cottage industry" business in a poor community in Kenya! 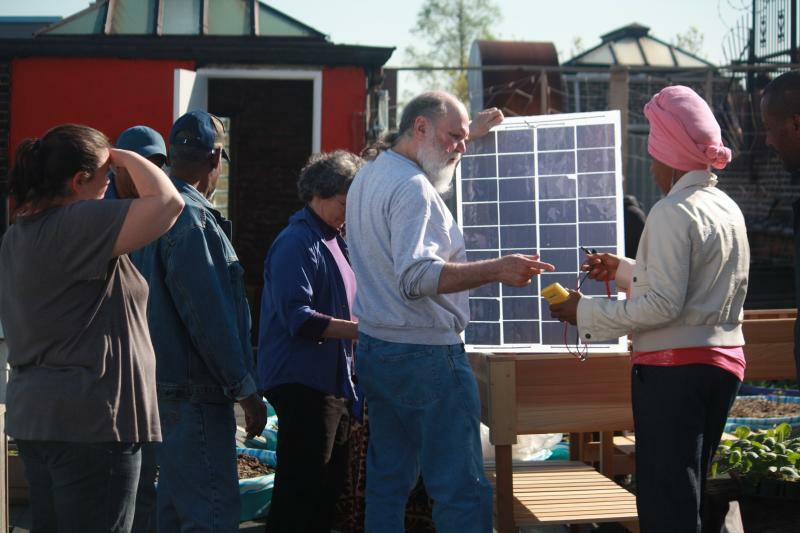 Kenya American Society participants, after finishing 65W PV module framing, Feb. 2012. August, 2016, Cambridge, Maine! Off-grid PV installation, with dedicated effort from five folks, eager to learn the basic solar elements. We were using two handmade, 65W modules assembled in 2007, by folks with little or no experience, in Harlem, NYC ! Cambridge, Maine, August, 2016, 2 homemade PV modules mounted on wooden rack, fixed to the pine tree, without inflicting any damage! A 12V, 130W system, to charge a 12V battery for lighting in the home. There will be some solar! 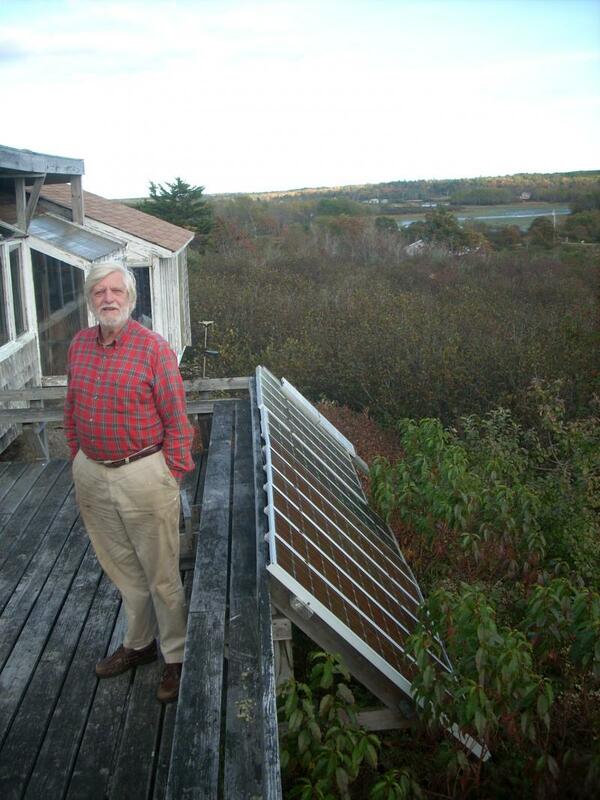 DADSOLAR is now operating the Solar Home built by Dr. Richard Komp, Jonesport, Maine. Get involved with the Downeast Solar Center - * New 2019 programs ! 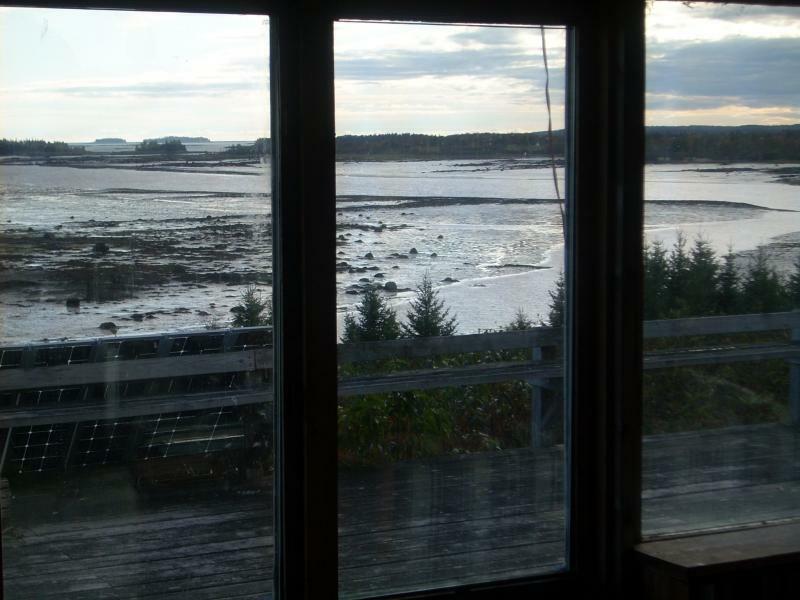 The Downeast Solar Center ﻿ is in Jonesport Maine, Solar Home! We are looking forward to your comments and involvement ! Please contact us today. We are always eager to help folks determine how solar and other renewable energy technologies may help them and help solve some of the problems of our planet and it's inhabitants. 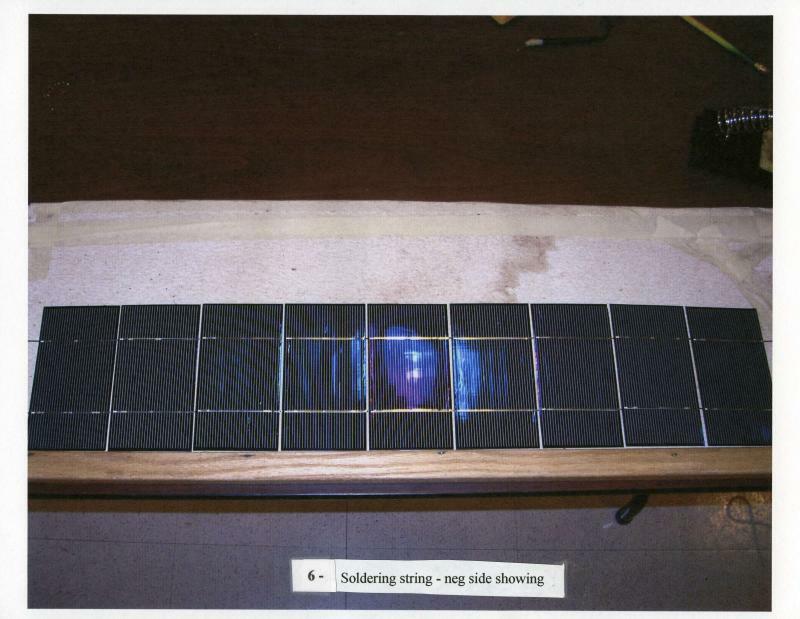 A soldered string of PV cells, ready forplacement (with 3 others), on 65w PV module. Our low-tech approach allows anyone to gain skills in this important field and become part of the solution. Workshop participants at Yellowhead Island camp, off Buck's Harbor, Maine, install two homemade 65 W PV modules for small off-grid system, MESEA, 2013. Gordon and John connect new PV array to the 12 V battery bank, Yellowhead Is., ME, MESEA workshop, Aug. 2013. Preparing for final wiring and framing of 65W module - Feb 17, 2008 - Harrington, Me, Oceola Grange. Handmade PV rack for 49, 65W PV modules, assembled at St. George PV workshop Fall 2008. Further updated picture of the Sept, 2015 Humble Farm solar PV array with 30 PV modules ... more than 7.2 Kw ! Charles a solar enthusiast from Rhode Island, soldering a string of cells for PV encapsulation. During the Solar PV Spring Intensive, Jonesport. ME - Apr. 2011. John and Charles at PV Spring Intensive Assembly workshop, April, 2011, set glass onto 3 strings of 12 solar cells. A 36 cell, 65W PV module. 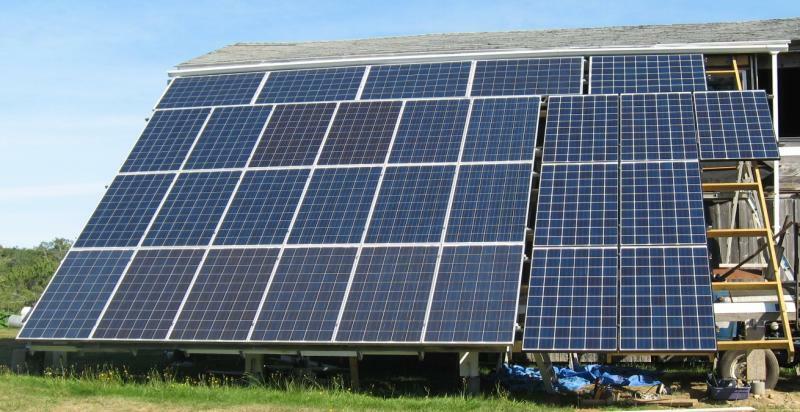 Four modules, assembled during the PV Spring Intensive, will be installed at Jonesport, ME, solar seminar center. 6 - four cut cells ready for string soldering cell ph charger assembly, 2013. 7 - Four cell string ready for series connection to three other strings for cell Ph charger, 2013. 8 - three strings of four PV cells, soldered in series connection (adds Volts), for 6V cell Ph charger, ready for frame, 2013. 9 - Finished 12 PV cell (6V), cell Ph charger in 'dollar store' picture frame, ready for Ph adapter wire connect (your Ph ? ), 2013. Please see the 'Services' page for full materials list and description of assembly process for the MESEA Solar Cell Phone Charger, Small Battery Charger and 65W PV module ... ! 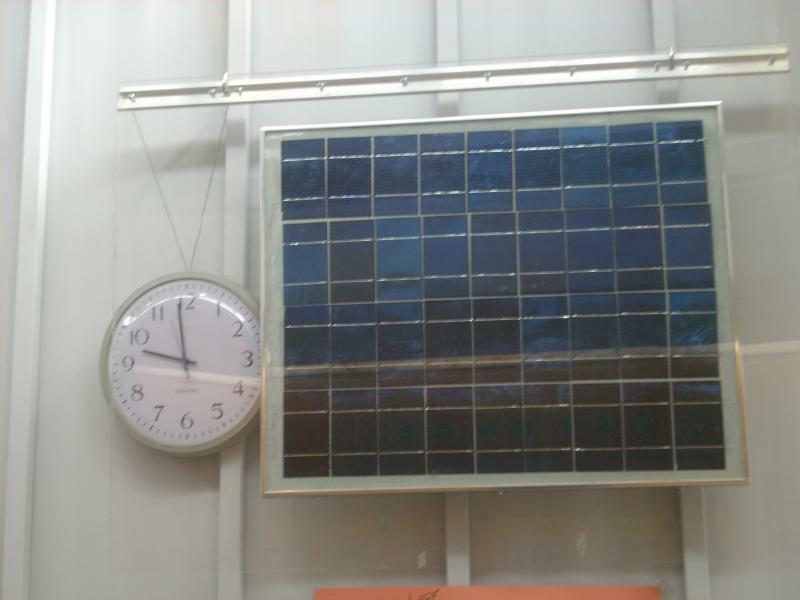 Solar PV powered clock at Manhattan Comprehensive HS, NYC, 2011. This PV module uses ambiant light, in indoor atrium, to supply power for 3V time piece. Any weight may be used in low-tech laminating process, to help the air-bubbles out the edge of the glass, during encapsulation of the PV module. The table is level, photo by Mishon, Apr, 2011, Bklyn, NY. 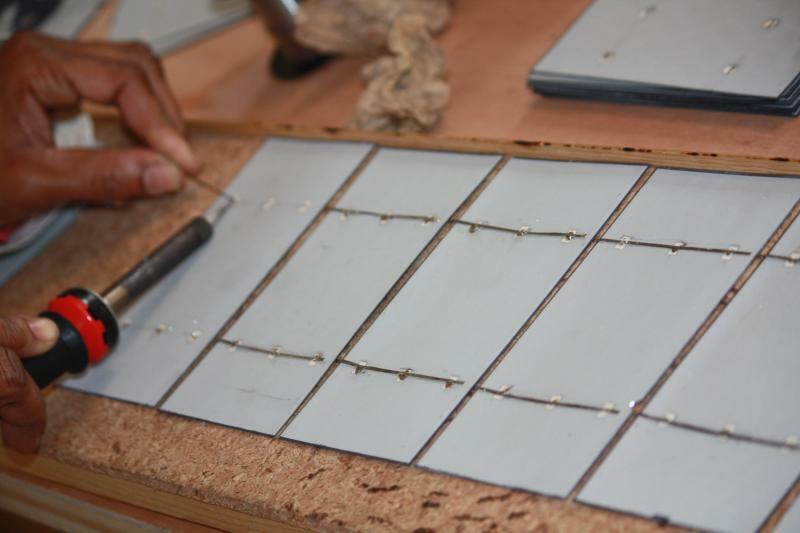 PV workshop participant, solders finishing touches on PV string, before testing. The positive ribbons must be added onto the back of the last cell. Photo by Otto, thanks, Brooklyn, NY, April, 2011. -1- Close-up of cut PV cells, being soldered in series, for impromptu battery charger assembly workshop at ASES Conference, Raleigh, NC. May 18, 2011. 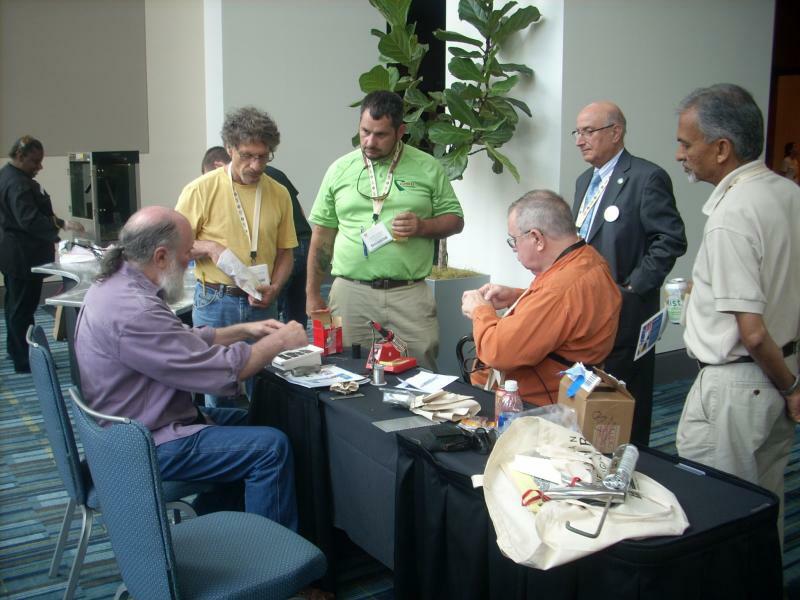 -2- Final wiring of battery charger, at ASES Conference hallway, PV workshop, May 18, 2011, Raleigh, NC. The AA, C or D size, solar "trickle charge", -battery charger, can charge regular Alkaline, as well as, "re-chargble" batteries. The case, made for MESEA, by the Penobscot Indian Nation, Old Town, Maine. Student group, March, 2012, at the Manhattan Comprehensive HS class with MESEA facilitator, John Burke, during PV assembly workshop. 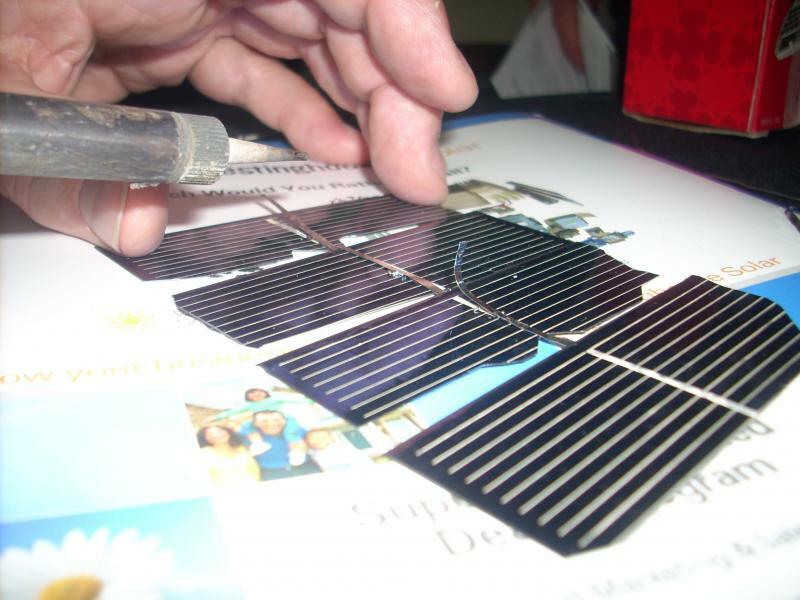 The liquid silicon encapsulation method, developed by Marco Antonio, of Suni Solar, Nicaragua, is used to seal the 4 strings of 9 solar cells on this 65W PV module. This PV workshop is our fourth annual solar project, with Man. Comp. HS, CDI and Solar1, of NYC. DADS, Inc. learning facilitator, John Burke, applies first application of liquid silicon encapsulant, at MESEA PV assembly workshop, Jonesport, Maine, Solar Home, Oct. 2011. MESEA solar PV assembly workshop participants, stand ready for encapsulation process on the 4 strings of 9 PV cells after soldering and testing. 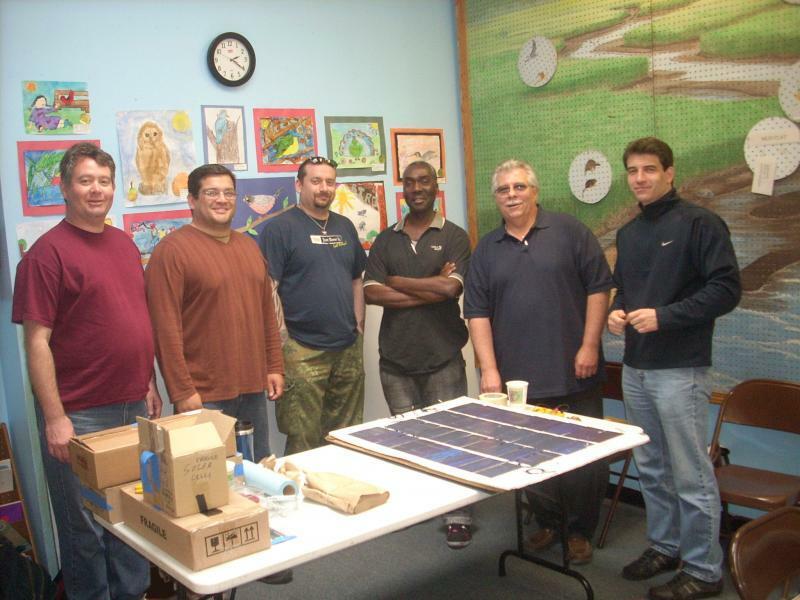 This workshop, Earth Day weekend, April, 2012, was hosted by DADS. Sunrise, at the Jonesport, Maine Solar Home of MESEA and DADS, Sept. 2013. Visiting Hawk perched on dead tree ! Cambridge, Maine folks discuss the steps required for installation of small PV system, according to the owners wishes for the trees. August, 2016, a well grounded system! Yes, there was precipitation that day! Looking from the south, at the completed 130W handmade PV installation. The tree has the rack 'tied' to the trunk, so as not to disturb the 200 year old pine! The 12V solar PV system will charge a battery for homeowner lighting. Cambridge, Maine, August, 2016. * DADS, Inc., is looking for a few "Good Folks" interested in being part of SEADS 'Intentional Solar Community Land-trust' affiliated with The Downeast Solar Center, established in Jonesport, Maine. 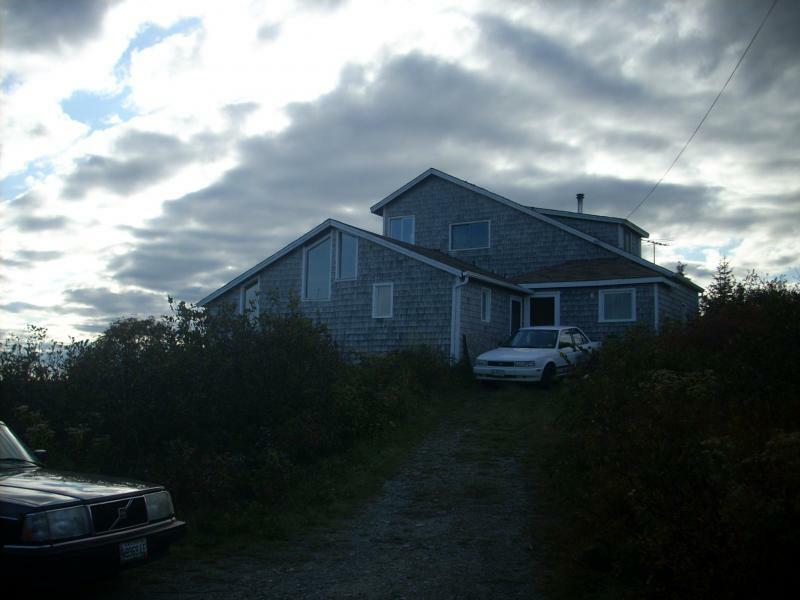 Extensive re-build and additional space to be constructed at 5 acre, ocean view, Solar Home site. Solar Educational Community Development Project, includes part-time family participation ! Please call phone #s listed below for more information. An opportunity to spend a week or more with an extended community of families in Maine, working toward a self-reliant lifestyle, utilizing solar energy and organic gardening techniques. Our focus is for a true 'World Peace', without the resource wars we have become accustomed to. Get Active ! Get involved with establishing a future for the next generation ! Spring / Summer 2019 ! 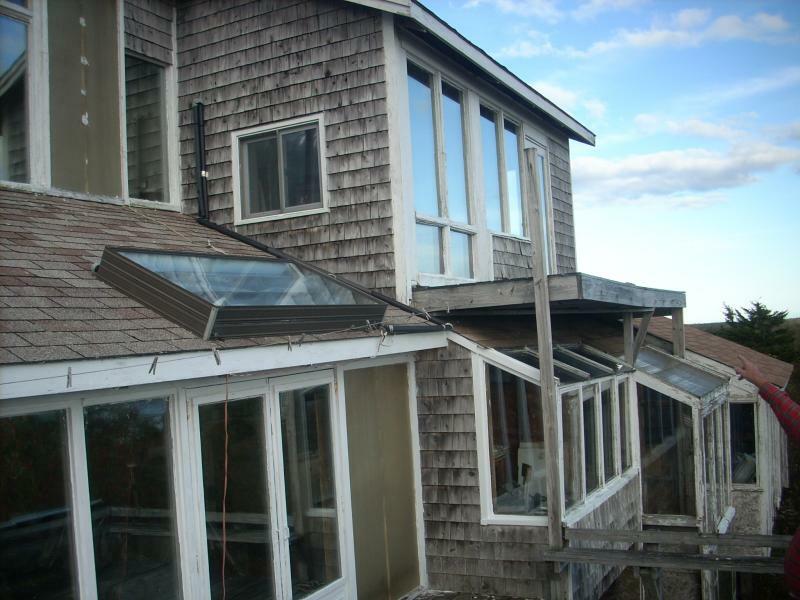 Our focus is re-kindled toward a Spring / Summer / Fall structure re-build program at the Jonesport Solar Home as well as the Seminar Center in Columbia, Maine. * Solar Community Land-trust Development effort now available for your participation and support. Interns needed for this important work. Please share this with folks who may be interested in learning about PV and Thermal, at the Washington Co., Maine, facilities. Call phone #s listed, it's up to you ! April 23, 2016 HOPE Festival with Peace & Justice Center of Eastern Maine ! (20+ years ! ), thanks ! Volunteer Check-in, HOPE Festival ! Univ. of Maine, Orono, Amy and Mike helped the Maine Solar Energy Association set up the demonstration for a cell phone charger !